Seattle has over 90 unique neighborhoods. 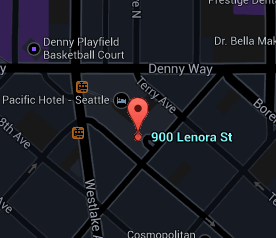 The location of 2200 Westlake is in the area known as Denny Triangle. The Denny Triangle is an interesting mélange of grocery stores, banks, coffee shops, restaurants, educational organizations, small boutiques, and local art galleries — all within walking distance. Urban living in the area is vibrant with options like town homes, lofts, studios and condominiums. There are also large parks near Denny Triangle, where one can relax and enjoy the urban outdoors. The neighborhood also enjoys convenient access to Seattle's major thoroughfares: I-5, I-90, SR-99, and SR-520. Walk Score helps you find a walkable place to live. Walk Score is a number between 0 and 100 that measures the walkability of any address. Denny Triangle sits on the southern edge of "The Amazone", a vibrant area just north of the downtown shopping district. Check out our condominium building profiles to see the condos for sale in the Denny Triangle, in projects like 2200 Westlake, Enso, Cosmopolitan, and Insignia. Every building has its own personality and attributes. The community is an important aspect of city living and can have an impact on how integrated it is with the residences. The 2200 Westlake building features can be explored here. A full list of amenities within the complex is displayed to help understand the offerings of the project. The 3 towers at 2200 Westlake are constructed of concrete and steel. The residential units feature high ceilings, floor to ceiling windows, gleaming hardwood floors, stainless steel appliances, granite countertops, walk-in closets, gas fire place, gas cook-tops, and generously sized decks. Amenities in the building consist of 24/7 concierge service, guest suite, Wi-Fi, theater room, game room, conference room, club room, state of the art fitness center and hot tub/spa. Amenities can be an important factor in determining the type of lifestyle that can be expected in each building.The amenities are arranged in groups to help navigate its features. = The building does offer this amenity. = The building offers this amenity and additional details can be found by clicking on it. = The building does not offer this amenity. All active, contingent, pending, and sold listings for the 2200 Westlake building. The Stroupe Group specializes in downtown Seattle condominiums. All the articles that have been published by the Stroupe Group concerning 2200 Westlake and Denny Triangle can be found here. Seattle nabbed the 8th spot on Walk Score’s annual Most Walkable Cities Ranking. It seems as though the South Lake Union neighborhood has dominated the public’s interest in newspaper headlines.